I hope that you had a wonderful day yesterday! My day was good and very productive. Are you excited that it's December already? I am and I'm not lol. 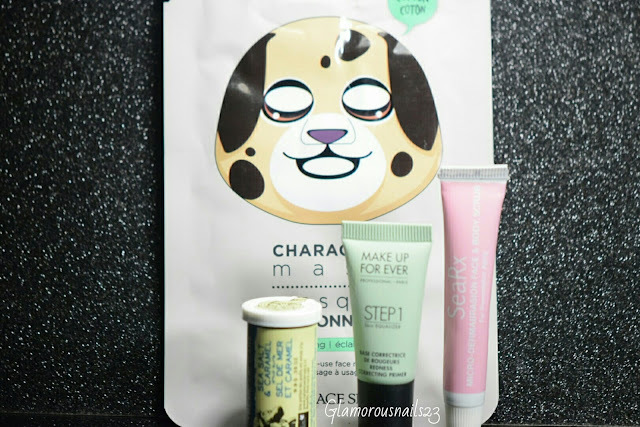 Today I have the goodies that were in my November TOPBOX to share with you. So lets get started! TheFaceShop Character Mask is exactly that. A mask. You would wash your face, take the mask out of the packaging and carefully place it onto your face. Leave it on for 10-15 mins and lightly tap on your face to absorb the remaining of the product into your skin. 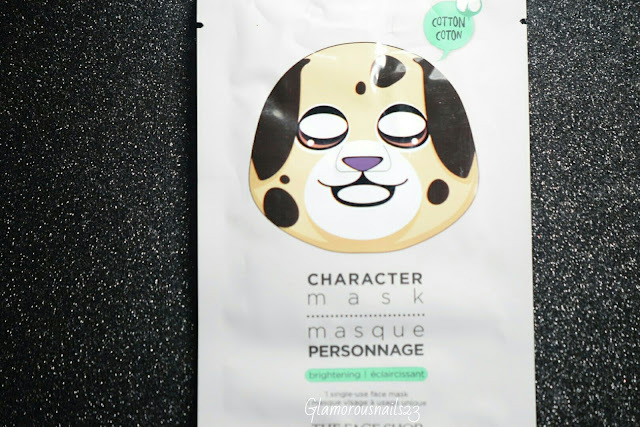 You can get three of these masks for $9.00 at THEFACESHOP.CA or in stores. I actually haven't tried a face mask before so you could only imagine my excitement when I saw this in my TOPBOX. 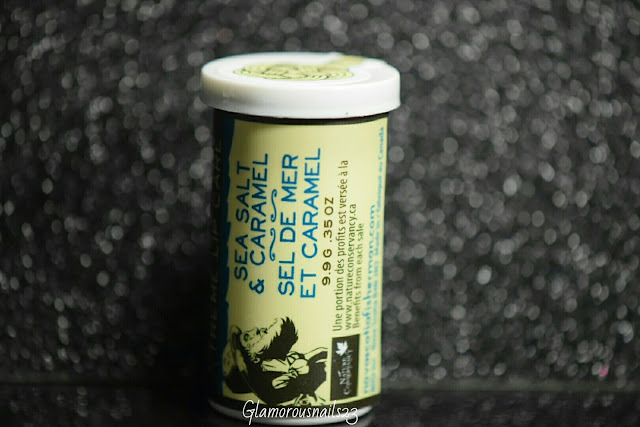 Nova Scotia Fisherman eXtreme Skin Care Lip Balm is a sea salt & caramel flavored lip balm. It contains 100% natural ingredients and contains 93% organic materials. This can be purchased at NovaScotiaFisherman.com for $6.95. This is the first time that I've ever heard of this bran. I'm actually pretty excited to try this because I only use two brands of lip balms. Blistex and EOS. I'm really intrigued by the sea salt & caramel. 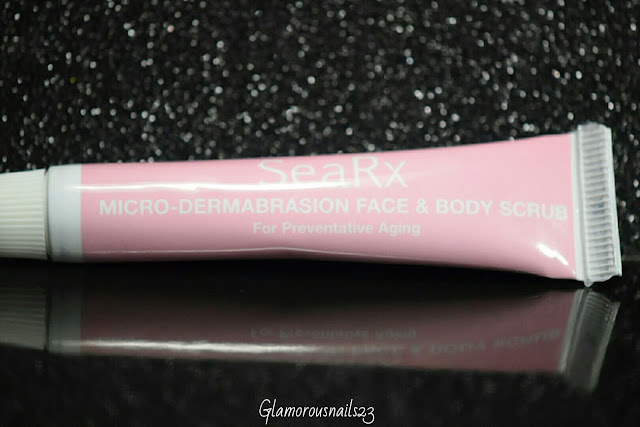 SeaRx Micro-Dermabrasion Face & Body Scrub is just that. A micro-dermabrasion face & body scrub. To use it you would wet your face and apply a dime-size amount to your forehead, cheeks, nose, and chin. Massage gently for one to two minutes in a circular motion. Rinse thoroughly with warm water and pat skin dry. Apply sufficient amount to other areas of your body massage gently, rinse thoroughly, and pat dry. This is to be used no more than twice a week. You can purchase this at SeaRxBeauty.com. Costs $42.11 for 100g. I received two of these in my TOPBOX. They're pretty small but I'm assuming seeing as this should only be used no more than twice a week and in very small amounts they will last some time. I have never tried micro-dermabrasion so I can't wait to start using this. 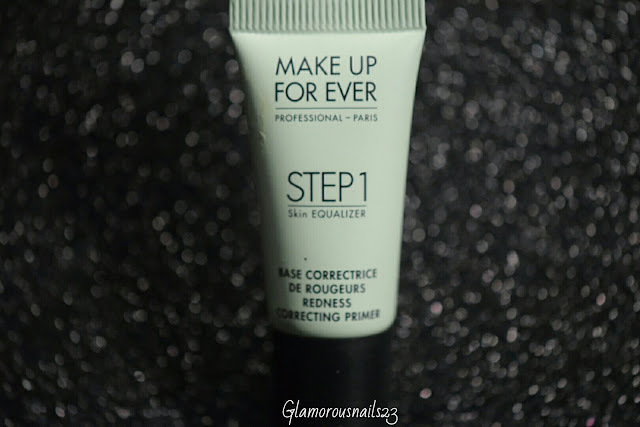 This is a makeup primer that assists with balancing the skin's texture, neutralizes redness, and ensures longer-lasting makeup wear. To use you would apply before applying makeup to skin, dab a small amount on the redness areas with fingertips or sponge in a downward motion. You can find this at Sephora and sephora.ca. $43 for 30mL. I've never used a correcting primer before. I don't get redness on my face but I'm still going to give it a try seeing as it also helps to balance out the skins texture and ensures longer-lasting makeup wear. And it's from Make Up For Ever so why not! That's it for my November TOPBOX. Have you ever tried any of the products that I received this month? What's your thought on them? Let's chat down below!